How and Where to Buy Synthroid? Order the brand name Synthroid through our Canadian Dispensing pharmacy at a huge discount. CanadianPharmacyWorld.com carries brand and generic medications from International pharmacies around the world with a valid prescription from your doctor. Check out our latest Featured Medications and more. For more further assistance, please call Customer Service at 1866-485-7979. 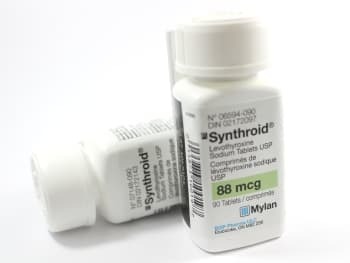 Are there Alternative Names for the Brand and Generic Synthroid? The brand name Synthroid (Levothyroxine) comes from Canada manufactured by Mylan. Another brand is also known as Thyronorm comes from India manufactured by Abbott. There is no generic available for this medication. We also carry Armour Thyroid. What Dosages and Forms is Synthroid available in? What is Synthroid used for? Synthroid (Levothyroxine) is a thyroid hormone supplement that is used to treat people who do not produce enough thyroid hormone on their own. Levothyroxine replaces the hormone that is normally produced by your thyroid gland to regulate the body’s energy and metabolism. Synthroid is also used to treat and prevent goiter (enlarged thyroid gland) that is caused by hormone imbalances, radiation treatment, surgery or cancer. Levothyroxine should not be used to treat infertility unless it is caused by low thyroid hormone levels. It may take several weeks for this medication to have a noticeable effect on your condition. What are the Possible Side Effects of Synthroid? Are there any Precautions or Drug Interactions for Synthroid? You should not use Synthroid if you are allergic to Levothyroxine or if you have any other allergies. Before you start using this medication, inform your doctor or pharmacist about your medical history especially if you have increased thyroid hormones, decreased adrenal gland function, heart disease, high blood pressure or diabetes. This medication can be used during pregnancy but inform your doctor if you are pregnant because your dose may need to be adjusted. Levothyroxine passes into breast milk but is unlikely to harm a nursing infant. Synthroid tablets should be stored between 68 and 77 degrees F (20 and 25 degrees C) away from heat, light and moisture and out of the reach of children and pets. This medication should not be stored in the bathroom.